Message boards : Number crunching : Thread closed! EDIT: BOINC stats graphic needs to catch up. Message 39912 - Posted: 25 Oct 2004, 6:47:30 UTC - in response to Message 39895. > EDIT: BOINC stats graphic needs to catch up. Message 39935 - Posted: 25 Oct 2004, 10:22:33 UTC - in response to Message 39895. Message 39966 - Posted: 25 Oct 2004, 13:03:33 UTC - in response to Message 39912. > > EDIT: BOINC stats graphic needs to catch up. I knew that. The stats sites only update once a day to cut down on server activity. See, I knew that. Hey! You're 8 days older than me on SETI! I don't see too many that are older, mostly younger. Message 39968 - Posted: 25 Oct 2004, 13:07:14 UTC - in response to Message 39935. Message 39971 - Posted: 25 Oct 2004, 13:11:43 UTC - in response to Message 39956. Yeah, well I'm only running SETI and 2 other projects with 1 PC. Divide yours by 4 (your number of PCs) and you would have 8750 average with just 1 PC. Message 39972 - Posted: 25 Oct 2004, 13:14:47 UTC - in response to Message 39957. I would venture to say that you're running SETI on multiple PCs. Message 40077 - Posted: 25 Oct 2004, 20:29:13 UTC - in response to Message 39966. > > > EDIT: BOINC stats graphic needs to catch up. > activity. See, I knew that. Message 40078 - Posted: 25 Oct 2004, 20:31:50 UTC - in response to Message 40077. > > > > EDIT: BOINC stats graphic needs to catch up. > > activity. See, I knew that. Message 40082 - Posted: 25 Oct 2004, 20:52:18 UTC - in response to Message 40078. Message 40087 - Posted: 25 Oct 2004, 20:56:57 UTC - in response to Message 40082. Message 40127 - Posted: 26 Oct 2004, 0:34:42 UTC - in response to Message 40077. > > older, mostly younger. If you read my profile, you can see my history with SET@Home and my upgrades to do faster crunching. I also started with a 486 DX2-66Mhz machine. Back then I wasn't running 24/7, I only ran when I was at home and overnight while I slept. It took a week sometimes to do one WU. Message 40128 - Posted: 26 Oct 2004, 0:39:40 UTC - in response to Message 40078. > > > > > EDIT: BOINC stats graphic needs to catch up. > > > activity. See, I knew that. In other words, BOINCstats updates once a day where stats are coming from SETI. Message 40224 - Posted: 26 Oct 2004, 4:42:44 UTC - in response to Message 40128. > > > > > > EDIT: BOINC stats graphic needs to catch up. > > > > activity. See, I knew that. Not completely correct. There are some other projects out there you know. But SETI only updates once a day. Message 40290 - Posted: 26 Oct 2004, 13:15:40 UTC - in response to Message 40224. > > > > > activity. See, I knew that. > SETI only updates once a day. I think we are starting to get into semantics. 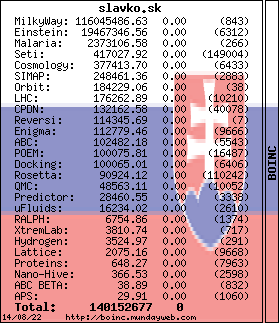 If the stats for SETI are updated once per day, then the way I see it (my literal mind kicking in) BOINC stats updates once per day when receiving the stats updates from SETI. And, I do know that there are other projects out there. I run 2 others besides SETI and am signed up to run another one next year. And, no I do not know how the other projects update (once a day, twice a day, hourly....). I'm not really concerned about it, and for that matter, I'm really not too concerned about SETIs updating either. Message 41681 - Posted: 31 Oct 2004, 13:04:31 UTC - in response to Message 40087. Message 41682 - Posted: 31 Oct 2004, 13:06:14 UTC - in response to Message 39895. > Yeah, I went over 10K in credit today!